Ackermann is important because it can ruin an otherwise great setup. Knowledge of it is important for all types of auto racing, not just circle track. We have readers from all walks of racing life. Recently I talked with a guy who races vintage stock cars on the west coast. The first thing I noticed about his front end was that the older design had a great deal of Ackermann built in. More modern designs incorporate less Ackermann. Each front steering system has its own particular design and can produce excess Ackermann if not setup correctly. In today's racing world, the dirt cars are more balanced in their setups and the LF tire does much more work. This trend has made the dirt cars more consistent and faster under most conditions. With the asphalt teams, we see a move toward softer front springs, high rebound in the front shocks to hold the car down and stiffer RR springs. This arrangement causes the LF tire to be much more in contact with the racing surface, carry more loading and to work harder than ever before. If the front tires don't track exactly where they should, there will be problems getting the car to turn. 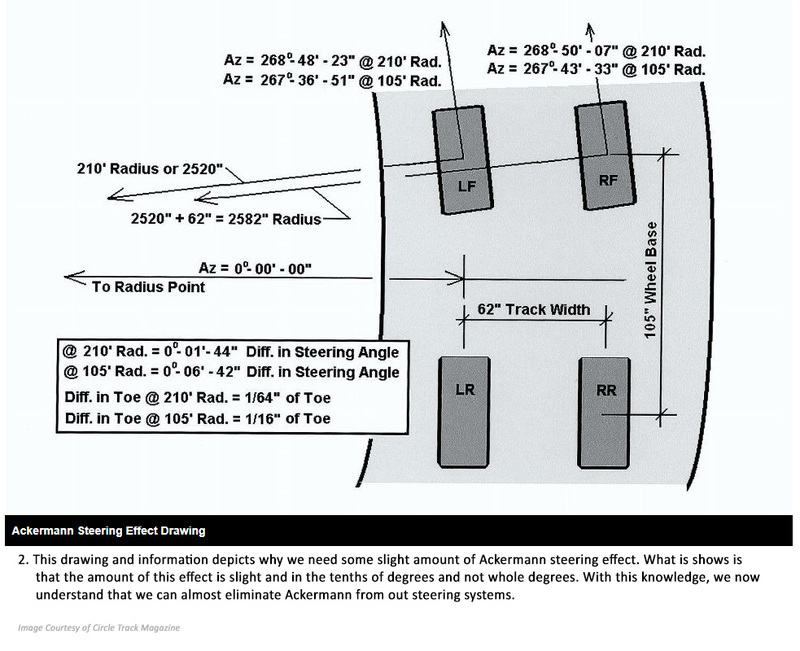 When we have Ackermann effect present in our steering design, it means that the amount of toe-out increases as the steering wheel is turned and with Reverse Ackermann, toe is reduced. There are different static settings for front end toe that are dependent on the size of the racetrack, the banking angle, and the type of tire used. Most short track stock car teams use toe-out to stabilize the front end and keep it from darting back and forth across the track. Conventional wisdom tells us that the car will need more static toe-out for the smaller radius tracks. At big racetracks of more than a half-mile, less toe-out is required. The amount of toe-out used typically ranges from one-sixteenth to one-quarter of an inch. The truth is, we need very little Ackermann effect in most situations when racing on an oval track, be it dirt or asphalt racing. 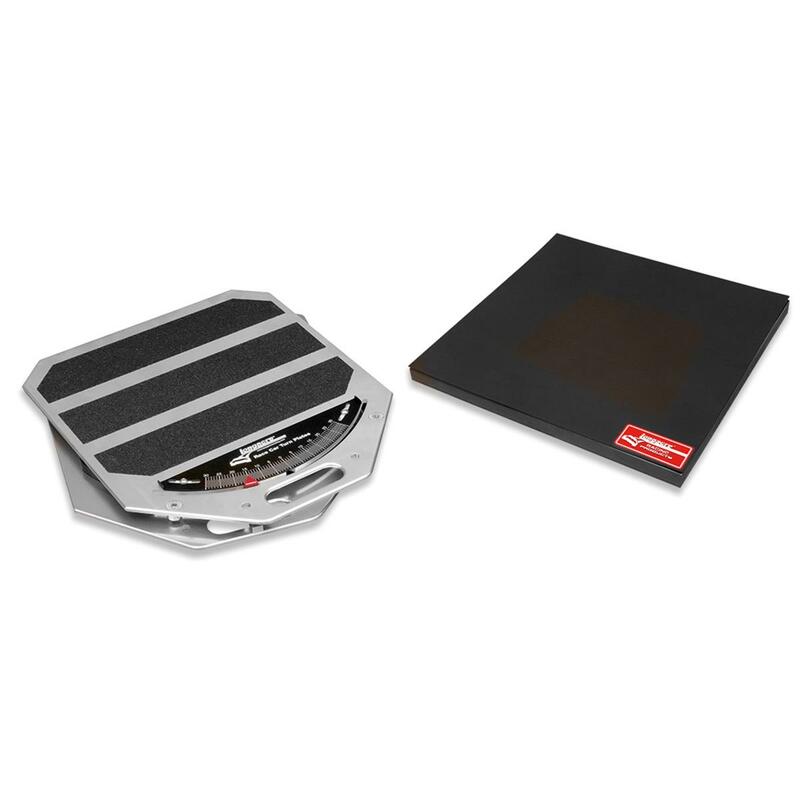 Even on very tight quarter-mile tracks, the LF wheel will only need an additional 1/16-inch of toe over the RF wheel to correctly follow its smaller radius arc. That is 0.112 degrees or a little over one tenth of a degree. You can imagine my reaction when a racer tells me that they only have a couple of degrees of Ackermann in the car. A degree of Ackermann equals 1/2-inch of toe for an 85-inch circumference tire. So, if we have two degrees of Ackermann in our steering systems that would equal an additional inch of toe when we turn the steering wheel. 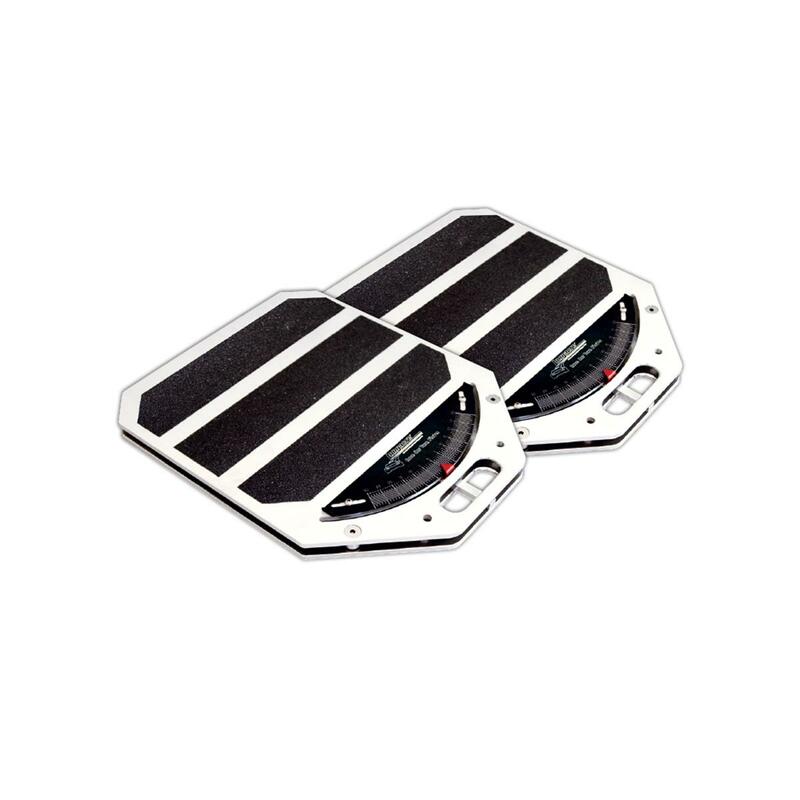 We would never think of setting an inch of static toe in our cars and then go racing. 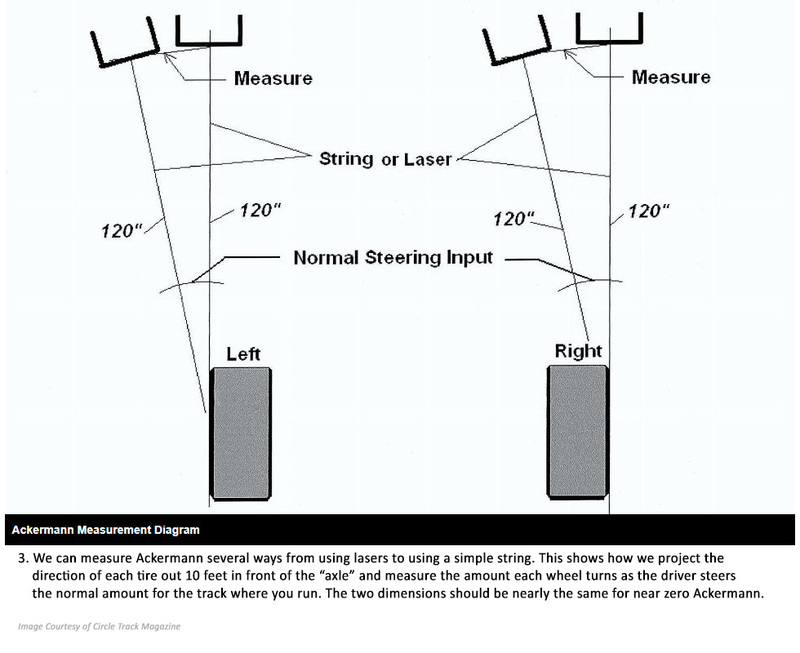 While all of this points to the fact that we all need a correctly designed steering system, many racers and car builders may not fully understand the steering systems in their cars and how they work to produce or cancel Ackermann. Here is an explanation of how it works. There are several different ways that your car could be producing excessive Ackermann effect. The most common is when we install the wrong spindles or other steering system components on our car. Over the last few years, teams and car builders have worked hard to reduce the unsprung weight, or the weight of the wheel/spindle assembly. I'm not sure why. One way to accomplish this was to install a lighter spindle. At first car builders began using smaller, stock compact car spindles on the front ends that were designed for the Drag Link Steering system. At the same time, custom spindles were being fabricated for the newer design and very popular rack-and-pinion steering system. These later spindles were different in design from the stock spindles because they had steering arms that were pointed straight ahead from the ball joint instead of being angled in from a top view at the tie-rod end like the ones used on the drag link steering systems. This caused a tremendous amount of Ackermann. Even in systems designed to use the newer spindles, we can have excess Ackermann. The lengths of the steering arms and the position of the rack-and-pinion fore and aft can contribute to producing excess Ackermann. There are a few ways to check for excess Ackermann in our race cars. The best way is to use a laser alignment system to measure how much each front wheel turns and compare the two. The laser system can also be used for rear end alignment, right side tire alignment and bump steer. A less expensive, but adequately accurate method is to use strings to measure your Ackermann. I have used this method and if done carefully will yield the results we are looking for. Almost everyone has used strings to align a race car. A string pulled tight is always straight, we can count on that. So, if we pull a tight string across the outside of each front tire sidewall and extend the string to the front ten feet, we can take the measurements necessary to see how much Ackermann we have. The procedure is as follows: 1) Put the front wheels straight ahead. 2) Pull a string across the outside of each front tire (avoid the lettering portions of the sidewall) and place a mark on the floor (on a piece of masking tape) exactly 10 feet from the spindle pin to mark where straight ahead is. 3) Then turn the steering wheel approximately the same amount the driver would in the turns where you race. 4) Again, make a mark on the floor at 10 feet where the string extends from the outside of each front tire. 5) Measure the distance between each set of marks for each wheel and compare the left wheel with the right wheel. The Ackermann Toe Chart shows how much toe is gained in relation to differences in the left and right wheel measurements for different size tires. 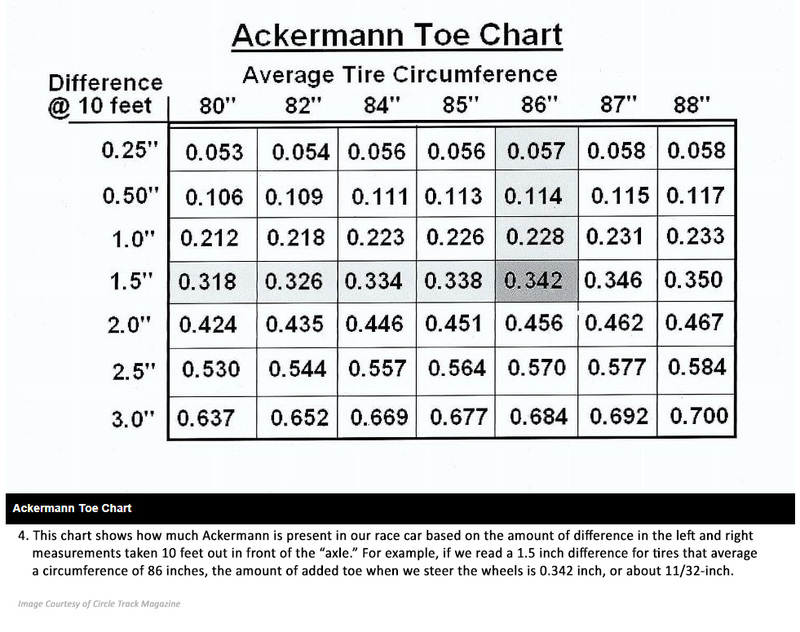 We can average the left and right tire sizes and look at that number when finding our Ackermann on the chart. Remember that if the left wheel moves farther than the right wheel, then we have Ackermann, or toe gain. If the right wheel moves more than the left wheel then you have Reverse Ackermann or loss of toe. If your car gains or loses toe, there are a couple of ways to correct the situation. You can adjust the length of one or both of your steering arms to compensate for Ackermann effect. This works best for a car where the steering wheel is always turned to the left as opposed to a dirt car where the driver turns both right and left. Lengthening the left steering arm will reduce the amount that wheel turns with a measured steering input, which reduces Ackermann effect. The opposite is true for the right steering arm—we would need to shorten it in order to reduce Ackermann. We can also change our drag link to move the inner ends of the tire rods forward to reduce Ackermann or rearward to increase it or to reduce Reverse Ackermann effect. This serves to change the Ackermann in both steering directions. If your spindles were not designed for your steering system, change to the correct spindle design and possibly have some lightweight ones fabricated to the exact specifications as the correct ones. I did that way back in 1997 with a brand-new car. 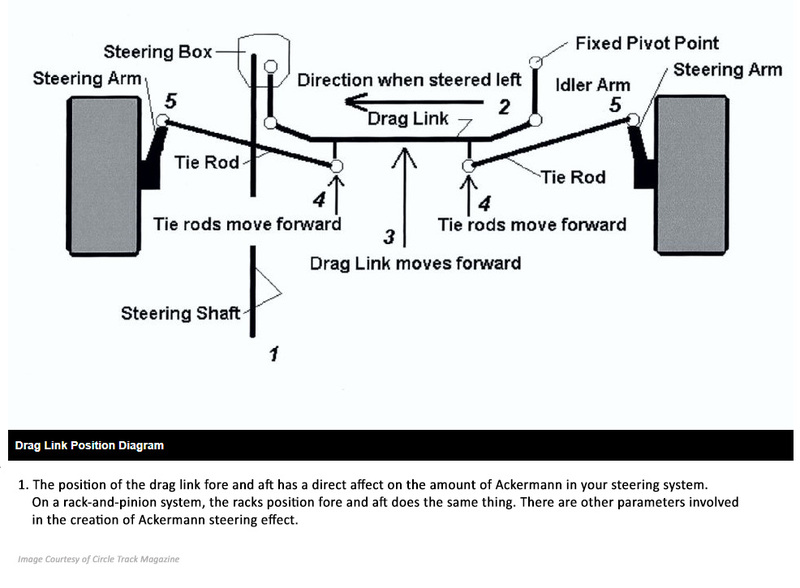 For a rack-and-pinion steering system, moving the rack forward in relation to the outer tie-rod ends will reduce Ackermann. Most dirt late model cars use the rack systems. So, we don't have the convenience of only having to improving our Ackermann effect in one direction, it must be correct for left or right turning of the wheels with those cars. Asphalt late model cars are also designed with rack systems. Instead of changing the length of the steering arms, it might be best to move the rack and keep equal length steering arms when working to reduce excess Ackermann. Make sure you know how much each of your tires are steering and reduce the Ackermann effect if needed. Then, when you balance your setup, both front tires will be working in perfect alignment to steer your car. A good steering race car is one that will have more turning power and is therefore more capable of running up front and winning races. If we pull a tight string across the outside of each front tire sidewall and extend the string to the front ten feet, we can take the measurements necessary to see how much Ackermann we have.